PCD Pharma Franchise in Odisha- Apikos Pharma is WHO certified pharma company Which is known for its quality-oriented pharma products and services. We have earned a name and reputation which we proudly say that you can trust on. We have strived on to join the league of India’s fastest growing Pharmaceuticals Company. We have outstanding goodwill which is a mark of our growing valuation & demand in the market. We welcome, Pharmacy dealers, Pharma distributors, Medical Representatives from all over India to become our Pharma Franchise Partner for our products in their region. So we are also offering PCD Pharma franchise opportunity in Odisha. Apikos Pharma is an ISO 9001:2015 certified companies who have always believed in sheer hard work and dedication to our professionalism. Our products are 100% pure, safe and made from genuine ingredients. We have different departments with specialized experts working like building blocks. Get in touch with the best pharma franchise company in your region & if you are looking PCD pharma franchise in Odisha then we are the best option for you. Contact us at +91-9855087879 for more detail of PCD Pharma franchise opportunity. Apikos Pharma is lead by two well-known personalities of Pharma Industry Mr. Harsh Sharma and Mr. Anil Kapoor who are considered as a master in the pharmaceutical industry at the different level in management category. Due to their kind guidance, Apikos has able to compete in the highly competitive market of Pharma industry and attained a good position and still willing to attain new heights of success. Apikos Pharma’s main focus is to make medicine to improve the health and quality of the life of the patient. Our transparency is one of our strengths and this has helped us to build a long-term relationship with our partners. To achieve our goal we are offering PCD Pharma Franchise in Odisha. We have spread our PCD Pharma business all over the country and are gaining recognition through the new franchises in the major states of India. And, Odisha is one of our target states. Apikos pharma is providing PCD Pharma Franchise in Odisha. Above all the health care sector is the main priority of the government that is why the government is opening many medical colleges and hospitals in Odisha along with this Health center are also being opened by the govt. So we can say that the Pharma business is the boom stage in Odisha. Apikos pharma invites distributors, market representatives, stakeholders and pharma experts for PCD Pharma Franchise from all the cities of Odisha such as Bhubaneswar, Cuttack, Rourkela, Sambalpur, Berhampur, Puri, Baripada, Balasore, Jaypore etc. You can call us at +91-9855087879 for all kind of details. Be our partner and know what success is and let’s take this company to new heights of success and profit. Be the part of the leading Pharma Franchise company and start your own business in the pharma industry. We are covering all the vacant location in Odisha for Pharma Franchise business. Our associates will get the best support from our end to set up their own business successfully in India. Grab the opportunity and be the part of one of the top Pharma Franchise Companies in Odisha and India. Apikos Pharma is the Best pharmaceutical company in India that offer the best quality PCD Pharma products in the market. Our products are DCGI approved. Our products are available in the market at affordable prices. There is the wide range of Our PCD products. Here we sharing some sample of our products. Odisha is the 11th largest of the state of India by Population. This state has the largest contribution to the economic growth of India. The state is surrounded with the various business sectors like IT Sector, education sector, the manufacturing sector, tourism sector etc. And Pharma is one of the most developed business sectors in Odisha. There is the hub of Pharmaceutical companies that manufactured the various kind of pharma products & export all over the country. The state governmeOdisha Odisha also investing the huge part of the money in Pharma industry sector. So there is very large & good scope of Pharma franchise business in Odisha. If you are thinking of investing your money in pharma business then PCD Pharma in Odisha is a good opportunity for you. 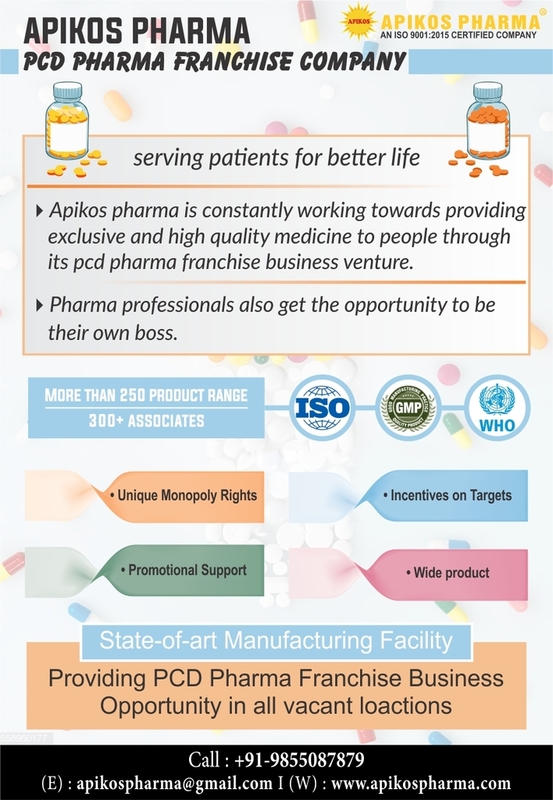 And, Apikos Pharma is the best option for you to choose the right Pharma Franchise. We are the best in the industry when it comes to Pharma PCD Franchise business. Our company has a good presence in the industry and with the healthcare professional. This will benefit our associates. Why Being Our PCD Pharma Franchise Partner in Odisha? Apikos Pharma is Chandigarh based PCD Pharma company that offering PCD Pharma Franchise in Odisha. We own a large variety of products list covering allopathic medicines, Homeopathic medicines, cosmetics, and equipment. We are the pioneer in the healthcare industry, no can even come close to us when it comes to the best quality of products. Our prices are the most affordable in a market we work keeping in mind about the welfare of society and their life. All the manufacturing is done in GMP-WHO plants which are certified. We are the legal company who work on ethical terms and follow drug regulator policies, WHO and much more. Drug Controller General of India (DCGI) approves our products. All products are FSSAI certified. we are approved by Food and Drug Administration (FDI). Genuine and affordable pricing which is competitive in nature. We give targets and investments which are usually genuine. Our dealings have characteristics of being long, transparent and honest with no hidden charges. We offer Self-Ownership of Business for the stockists. Delivery of products within 24 hours. Full support from our side. Online web portal at your support which is 24×7 available. Our promotional support not only will help you with the competition in your region but it will also help with making a good impression in the doctor’s chamber. Join hand with us and get an exclusive range of medicine to improve the healthcare industry. We strive to make your life healthier and happier.